Celebrating 2007 and the spirit of freedom with nifty stuff from 1922 to the present day! The show is peppered with moments from the classic James Stewart vehicle Shenandoah, which should be mandatory viewing for kids of all ages. 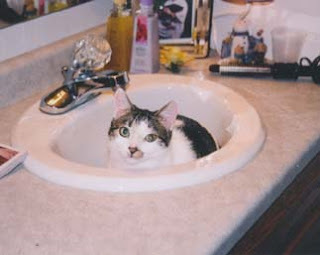 The picture of Hemi the cat in the sink has nothing to do with this show; I just think it's cute. Hemi occasionally drapes his body over my left arm and falls asleep while I'm typing, so he's kind of a silent partner to the podcast. Courtesy of the Podsafe Music Network comes Rockosaurus Rex with "Auld Lang Syne," the only way to start the new year, says I. After a Marines recruiting ad from Lefty Frizzell, we welcome back Billy Murray and Aileen Stanley, who spiced up UWA #3 with their rendition of "Keep Your Skirts Down, Mary Ann." This time around they perform a piece I found at the Internet Archive called "I'll Stand Beneath Your Window Tonight and Whistle." All that whistling inspired me to follow it up with a vintage excerpt from Lux Radio Theater; I bet you can guess what it is! "I Wonder How You're Doing" is a song I wrote and recorded at home in 1985; it becomes the latest Uncle Warren project to be hauled out of the attic and shared with the world. Then it's back to the present day for Jonathan Coulton's wonderful a cappella tune, "When You Go," and a brand-new piece by Los Gallos called "Free the People" - a terrific sentiment to start the new year with, says I. After an ad for the new Sunday edition of Newsday, we close out with Huddie "Leadbelly" Ledbetter doing his song "Where Did You Sleep Last Night," perhaps best known as the piece that Kurt Cobain made his own when Nirvana played MTV's "Unplugged." All this and 22 seconds of Firefly, too - what are you waiting for? Download the darn thing! This was a brilliant show. I just listened to it and now I'm going to go listen to it again. What Kirsten said, says I.